‘Drink more water' is to the health world what ‘Try turning it off and on again’ is to the tech world -- a simple trick with a high rate of success. We all know that supplying the body with enough water can help keep it functioning as it should. However, not everyone knows the specific amount of water their body requires. The makers of a new smart water bottle called Pryme Vessyl are hoping to open consumers’ eyes to the fact that the old '6 to 8 glasses of water a day' recommendation may not cut it for everyone. 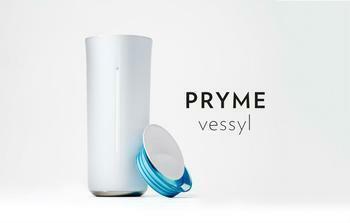 “Each of us have unique needs that change moment by moment depending on who we are, what we do, the time of day, and more,” says Dr. Hanson Lenyoun in a video for the Pryme Vessyl, a new smart cup that uses an algorithm paired with personal information to determine a person’s hydration needs. The sleek looking 16-ounce smart cup, created by Mark One, automatically records how much you drink. Upon reaching your ideal hydration level (your “Pryme”), you’ll see a glowing blue light. Hydration and activity data is also sent to a companion app, where consumers can see their information and needs laid out in log form. Since its release, reviews of the smart cup have been generally favorable. Many say the Vessyl’s hydration help did, indeed, help improve their energy and alertness. Others, however, had some qualms with the design of the product. Specifically, the complicated nature and tightness of the lid. The makers claim to have resolved lid tightness issues in the second edition of the cup. Improvements have also been made to the Pryme Vessyl app. Now, users can see even more personalized insights into their lifestyle and daily activity in order to determine how various factors might impact their hydration needs.